Most of us fortunate enough to live without the challenge of a disability may be unaware of what is contained in the Americans with Disabilities Act (42 U.S. Code § 12101 – 12103) and how it applies to a disabled person’s life of work, travel, and education. Unless their practice specifically addresses it, attorneys are apt to be similarly unaware. 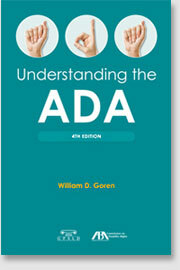 ADA consultant William Goren claims he wrote Understanding the Americans with Disabilities Act (ABA 2013) specifically to address what he considered to be the shortage of legal materials devoted to making the ADA understandable. The new Fourth Edition goes into some of the new complexities of recent disability claims. This book includes new expanded topics, including discussion of how ADA relates to sports and the Rehabilitation Act, use of negligence action as an alternative legal remedy, and improved checklists and forms. It also offers expanded guidance on legal remedies and determining whether or not one has legal standing. People wanting to file their own ADA claim with the Department of Justice can do so directly at the ADA website. More legal information to assist those with disabilities is available at lawhelpmn.org or at disability.gov. For job accommodation questions related to the ADA, see askjan.org, a service of the Office of Disability Employment Policy, U.S. Department of Labor.